BlackBerry continues to lose market share to iOS and Android | BlackBerry Blast! 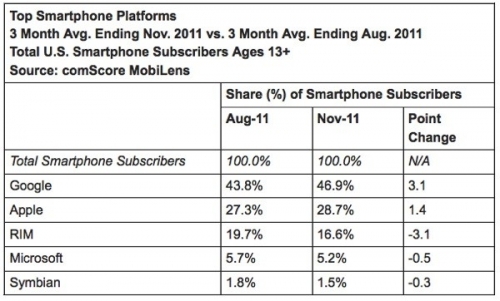 comScore has released their latest results and once again, BlackBerry is losing market share to Apple and Android. Interestingly, Microsoft also lost some market share despite the company's push to get Windows Phone 7 into the market. RESTON, VA, December 29, 2011 � comScore, Inc. (NASDAQ: SCOR), a leader in measuring the digital world, today released data from the comScore MobiLens service, reporting key trends in the U.S. mobile phone industry during the three month average period ending November 2011. The study surveyed more than 30,000 U.S. mobile subscribers and found Samsung to be the top handset manufacturer overall with 25.6 percent market share. Google Android continued to capture share in the smartphone market to reach 46.9 percent market share.